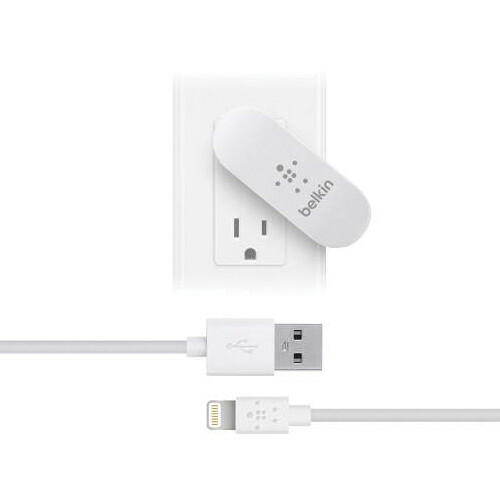 The white Dual Swivel Charger with Lightning to USB Cable from Belkin is a dual port USB charger that provides 10W / 2.1A of charging power per port and rotates up to 90° to help accommodate crowded outlets and make room for other plugs. In addition, it can be used in virtually any power outlet, and its prongs also fold to help make it easier to pack and place in a bag for charging on the go. This device will charge up to two devices simultaneously and is well suited for use while at home or while traveling. This charger includes a 4' Lightning to USB cable, and it can also be used to charge other devices when a compatible and separately available 30-pin or micro-USB cable is used. The Belkin Dual Swivel Charger with Lightning to USB cable (10W / 2.1A) is compatible with iPhone 5, iPad (4th generation), iPad mini, iPod touch (5th generation) and iPod nano (7th generation). The Dual Swivel Charger alone is also compatible with other tablets and smartphones when using their compatible cables (not included). Box Dimensions (LxWxH) 5.354 x 3.937 x 1.339"